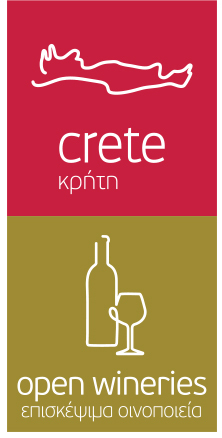 The brand “open wineries” highlights the sites of the island's wineries which are accessible to the public, as part of an integrated plan to promote Cretan gastronomy. Furthermore, with winery labeling, the Agronutritional Cooperation aims to develop wine tourism on the island through the promotion of local wine and indigenous varieties. Contributes to the certification and recognisability of the Cretan products as well as the enterprises, which stand out in the market due to their quality standards. The certified products and the enterprises obtain a powerful commercial identity in the international and domestic market. The products are projected at the “Centre of Cretan Gastronomy” (Rethymno) and in the certified enterprises ("cretan cuisine”, "cretan grocery" and "open wineries”). The certified products are selected by tourist enterprises, thus connecting local agricultural production with tourism. The certified products and enterprises are projected in the website and the booklets of the Region Crete and in incrediblecrete.gr. Further they are promoted in the guides for gastronomic routes of the Agro-nutritional Cooperation. An annual Marketing Plan is being implemented with important domestic and international exhibitions in target-countries, with the possibility to participate at a low or insignificant cost through the funding of the Agro-nutritional Cooperation. At the same time, byers are invited or business delegations are sent to target-countries abroad. Find out more about each label!